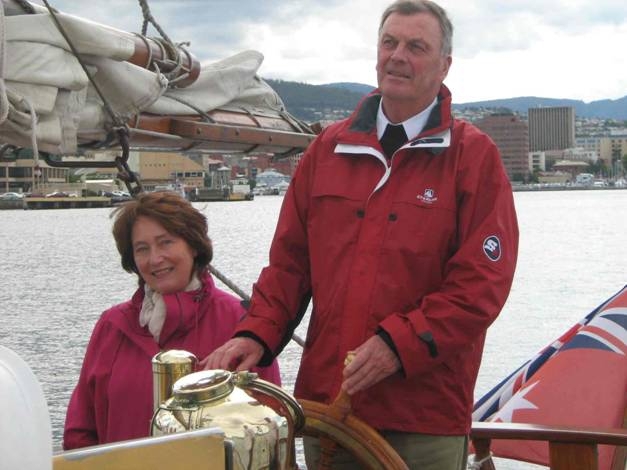 On Friday the 5 th December the Board of Directors and members of the Tasmanian Sail Training Association had the great pleasure of welcoming the Governor Mr. Peter Underwood and his wife Mrs. Francis Underwood for a sail on board the Lady Nelson. After a very wet and cold day the weather cooperated and the sun shone and the breeze blew gently for the sail on the harbour. Members on board looked very smart in their white shirts and the ship was handled in a very professional manner, such a pleasure to see. 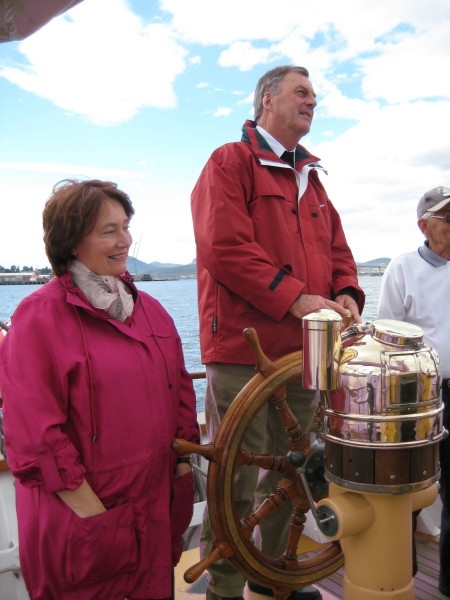 Both Governor Underwood and Mrs Underwood were given a guided tour of the ship and a chance to take the helm. After returning to the wharf, light refreshment and a glass of wine were provided and we were joined by many other members of the association to welcome our new patron. The Governor praised the association and its members for the lovely condition of the ship and the work we were undertaking for the community, and Our Chairman presented his Excellency with a copy of our latest publication about the history of the current Lady Nelson. What a pleasure it was to see so many friends on board, a chance to say hello and catch up with the news. 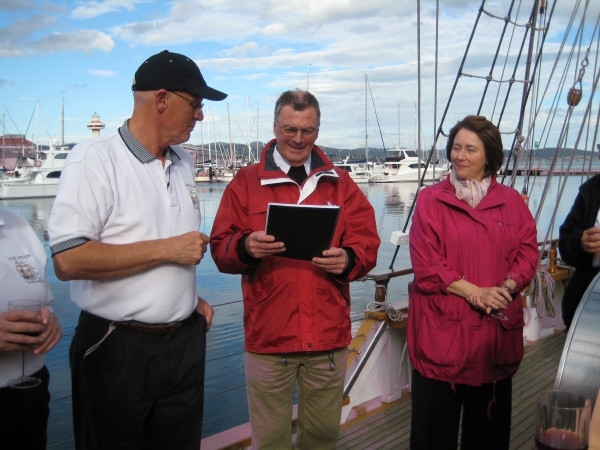 We welcomed our new Patron of the Tasmanian Sail Training Association, His Excellency The Honorable Peter Underwood AO, Governor of Tasmania, and Mrs. Underwood, on an evening harbor sail on Friday December 5th. The Day started with a chill in the air and 10 mm of rain. By 4 in the afternoon the sun was emerging, the chill was gone, and a 17 strong crew were assembled to introduce the Governor, His wife, and aide-de-camp, to the Lady Nelson. 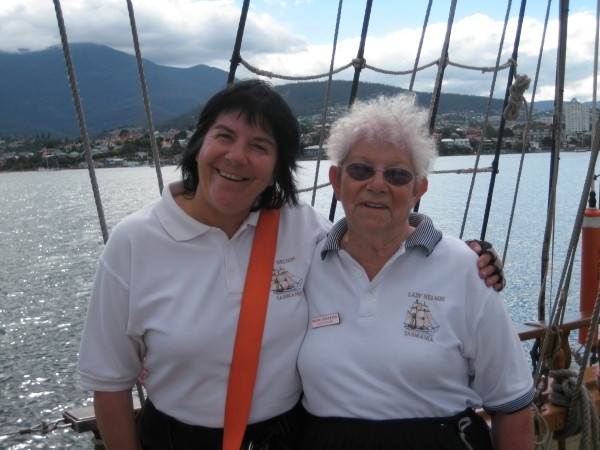 During the one hour sail on the Derwent, Master Allan, Bosun Brian and the seasoned crew, which included most of the board members, excelled in setting, bracing, handing and furling the sails smoothly and crisply. The Lady returned to the wharf where a large group of members of the association were waiting to come aboard to celebrate the approaching holiday season. 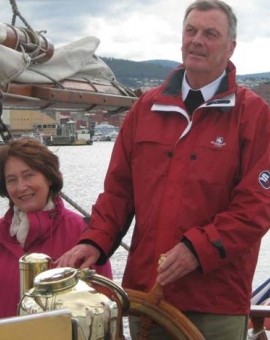 All enjoyed a drink and delicious finger food while the Governor learned about some of the history of both the original and the current Lady Nelson and how the Sail Training Association of Tasmania operates. 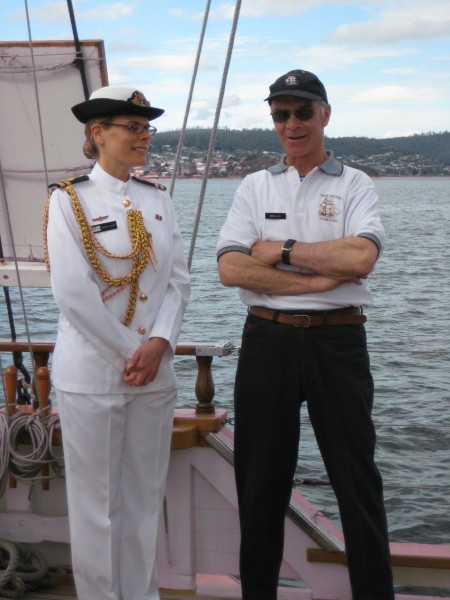 His Excellency, who served in the navy, and Mrs Underwood appeared to enjoy their sail and be generally impressed by the organisation.